“Watch Bees” is in Asimov’s Science Fiction, August 2011, Vol. 35, No. 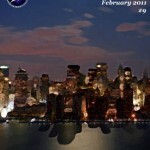 8, edited by Shelia Williams. Cover of August 2011 Asimov’s Science Fiction. Cover art by Jeroen Advocaat. 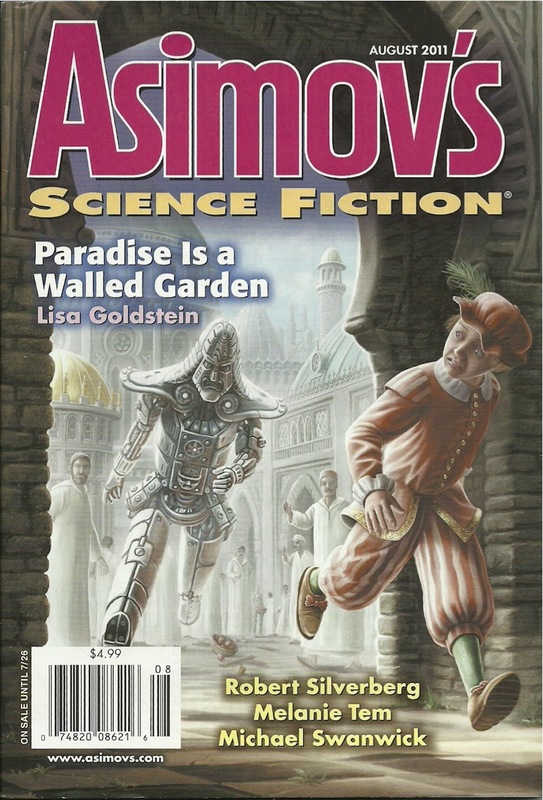 “Watch Bees” is in Asimov’s Science Fiction, August 2011, Vol. 35, No. 8, edited by Sheila Williams. Picking his way through morning glory vines, over rolling chunks of old pavement, David made his way to the edge of the ditch. Kneeling down, he got close enough to the dandelions and clover to see that the bees visiting them were striped the distinctive orange-and-black of watch bees. Looking up, David took in the farm as a whole. The paint on the farmhouse and barn wasn’t fresh, but it wasn’t peeling. The garden was big. The fields grew food, not just biofuel crops. He was six or seven miles from town, having rejected each of the farms he’d passed, but this one looked promising. Update: “Watch Bees” has been reprinted in the Russian Magazine Esli! “Like a Hawk in its Gyre” is up at Redstone Science Fiction, issue #9, February 2011, edited by Michael Ray. “Like a Hawk in its Gyre” is up at Redstone Science Fiction, February 2011 (issue #9), edited by Michael Ray. Update: “Like a Hawk in its Gyre” has been reprinted in audio form on Escape Pod, read aloud by Tim Crist. My first Esperanto-language short story “Paŭzo en la stacidomo Union,” appears in the new issue of Beletra Almanako! 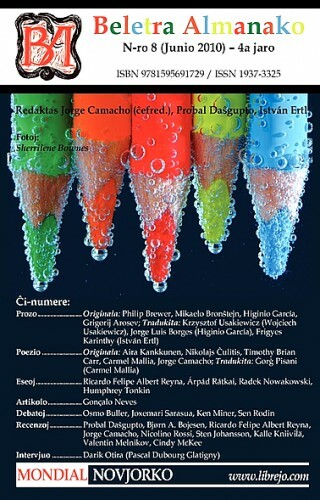 My first Esperanto-language short story “Paŭzo en la stacidomo Union,” appears in the new issue of Beletra Almanako! My contributor’s copy arrived today. I even made the cover. I am in very good company—a veritable who’s who of current Esperanto literature. If you can read Esperanto, pick up a copy today! “An Education of Scars” is up at Futurismic edited by Christopher East (fiction editor) and Paul Raven (publisher and editor-in-chief). “Salesman” is in Lady Churchill’s Rosebud Wristlet , Issue #13, edited by Gavin Grant and Kelly Link. “Anger Management” in the anthology Why I Hate Aliens , edited by Marissa Lingen. Published by Stone Garden (out of print). “Reading is Fundamental” appears in the second Darkfire anthology The Age of Reason: Stories for a New Millennium, edited by Kurt Roth, from SFF Net, 1999, ISBN 0-9669698-1-2. “Reading is Fundamental” appears in the second Darkfire anthology The Age of Reason: Stories for a New Millennium, edited by Kurt Roth, from SFF Net, 1999, ISBN 0-9669698-1-2. Available from Amazon, Barnes and Noble, or directly from the publisher, SFF Net. I’m hiding in the tall weeds behind the compost heap, which is good, because the sergeant looks behind the woodpile before heading to the outhouse. I listen real carefully and am glad to hear the splashing sound of a good piss. That always puts the sergeant in a good mood. If he can start the day with a good piss he’ll usually give me breakfast. Otherwise I sneak away and don’t come back until lunch time. . . .
My story “The Nightmare Flask” can be found (if you happen to know a collector of obscure gaming journals) in The Judges Guild Journal , Oct/Nov 1979 (number 17).